1. Crumble or shred the cheese. In a bowl, toss together the cheese and flour. 2. In medium sized sauce pan bring the hard apple cider to a boil. 3. Reduce heat to low and add the cheese mixture a handful at a time, stirring until melted before adding more. 4. Add the vinegar and stir together. 5. 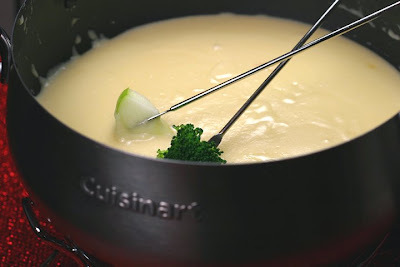 Pour the precious golden cheesy elixir into a fondue pot. Notes: Cougar Gold cheese is made by Washington State University: http://www.wsu.edu/creamery/. I like the part about drinking the hard apple cider! This really would be great to serve at a dinner party. I also like all your Cheese Delivery Devices! Oooh, broccoli and ham chunks!!! Wow! This sounds fantastic. I love cheese! I love your "delivery service." Laura, this is another surefire winner. This would be great for a gang watching football. Nice. I love fondue and I love hard apple cider. Together they sound very delicious. I'll have to try it. just pour it in my mouth, forget the bread... melty cheese.. oh god! and i know apple and cheddar go well! Roflmao! Thanks for the laughs and the comments! I love cheese and I love hard cider even more. I am definitely going to have to try this sometime. I am a cheese lover, I can't wait for my husband to have off on my birthday,sounds good with nice bottle of a champagne! I love fondue and I love hard cider, so I'm pretty sure this is the best invention ever! I came across this recipe and it sounded outrageous, so I saved it. Then, just a couple of weeks later, I found some Cougar Gold cheese in a little deli (it's usuall tough to find over here in Husky territory). Clearly, the universe was telling me to make this cheese fondue. So who am I to argue? And it WAS outrageous! Thanks! !